The title of Hassan Mahamdallie’s one woman – plus one oud player – show comes from Koofil, by the Somali national poet Sayyid Mohammad Abdullah Hassan. Better known in the UK as the ‘Mad Mullah’, he was the man who, with his army of feared Dervishes, led the Somali resistance against British occupation. The poem is a bloodthirsty celebration of the death of Colonel Richard Corfield (‘Koofil’), whom the Dervishes killed in action in 1913. This is a play preoccupied with what happens to the dead. 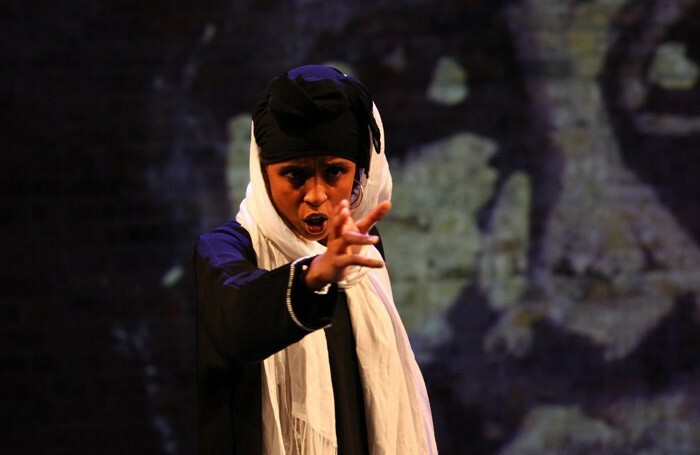 It’s a neat piece too, carried by a tremendous performance by Yursa Warsama – for whom it was written – who portrays both the young British-Somali woman, caring for her dying grandmother in Woolwich, and her fearsome great-grandmother, a proud Dervish warrior who fought the British. The sense of place – whether the deserts of Somalia, or a London living room filled with khat-chewing ex-pats – is always nicely evoked, thanks to Mahamdallie’s subtly lyrical script, in which English and Somali freely slip and slide over each other. There’s a real and understandable anger at the heart of the piece – particularly when you take in the parlous state of modern Somalia – but one, you feel, that needs channelling a little. The juxtaposition, for instance, of how the Americans (boo, hiss) treated the body of Osama bin Laden with how the girl’s ancestors allowed the British army to reclaim an English soldier they had killed, feels a little crude. It still remains a thought-provoking examination of identity, heritage and blood.